You’d think that Asia’s poorest country would be a cheap place to travel. Unfortunately, the presence of huge numbers of expats on fat UN salaries means you’d be wrong. It turned out to be one of the pricier countries so far, although as usual some of that was due to my own profligacy. The two big problems were food, drink and accommodation, which worked out more expensive than anywhere I’ve been except for the three rich countries (USA, Australia & New Zealand) that I’ve been to. To be honest, I could have saved a bit of cash on the food and drink by eating in more of the Indonesian-style warungs and not going srinking so much with the expats, but to be honest I was having too much fun (and enjoying a bit of a break from Indonesian food, which is pretty much all I’d eaten since mid-November). One other little quirk of East Timor is that it doesn’t have its own currency – instead, it uses the US Dollar, although with its own locally minted centavo coins in use instead of US Cents. My favourite is the 10 centavo, which has a cockerel on the back. Cool. Thanks to my time spent with the expats, Brits again topped the table of people I propped up the bar with. A new entry this time for Jordan, thanks to a UN Policeman I met from there. That’s it for my little 10 day stop in East Timor – back to Indonesia now. Last time I checked, the Lonely Planet’s info on getting an Indonesian visa in East Timor was slightly out-of-date, and missing a little information, so I figured having just been through the experience it might be useful to explain the process to anyone wanting to do the same. Regular readers, move along swiftly, there’s nothing to see here. Normal posting will resume shortly. Whether like me you’ve fallen foul of the fact Indonesia only gives a 30 day visa on arrival (which really isn’t long enough for a country that big), or whether your 60 day visa has expired, or if you’re flying into Dili from Darwin or Singapore, it’s pretty straightforward to get an Indonesian visa at their embassy in the East Timorese capital. And the good news is it seems to be pretty easy to get a 60 day one too. Before you head down to the embassy, you’ll need a passport photo taken with a RED background (no, I don’t know why either), a photocopy of your passport, and a letter explaining how long you want the visa for (30 or 60 days) and a rough outline of what you plan to do. Apparently this can be handwritten, but it’s probably safer to type one up. All of these can easily be sorted in Dili if you don’t have them before you arrive in the country. The embassy may open its doors at 8.30am, but that doesn’t mean that’s when you should turn up. They only process about fifty a day, and considering there’s lots of East Timorese people applying as well, this means you should really get into the queue at the front gate at around 6am (which is what I did, and I was 14th in the queue). While you wait for the doors to open, a security guard will pass you the forms through the gate, which you need to fill in with a BLACK pen (again, don’t know why, but make sure you do or you’ll just have to fill it in again). You also need to glue your photo to the form. The guards have glue. …until the doors open at 8.30am. You’ll be let in one at a time to see a person who checks you have everything you need, and that you’ve filled in your form. He then gives you a number and then you get back in the a queue, this time inside, and wait for the person behind the counter to call your number. The person behind the counter checks all your forms, takes your $45 (for 30 or 60 days), and your passport, and gives you a receipt and tells you to come back in three working days later (not the five that the Lonely Planet suggests; however double check on this locally as it may change again). Watch out for East Timorese and Indonesian public holidays (there are quite a few of both) as the embassy closes for both sets. …and hopefully it’ll be ready. The office is open for collections at 3pm. Bear in mind if you’ve already had an Indonesian visa and you’re running low on pages, they won’t stick the new one over the old one, but will use another whole page for it. Lovely. East Timor was never part of my original itinerary, but after my failure to get a 60-day visa in Melbourne (annoyingly I’ve since discovered it’s quite easy to get one in Perth amongst other places) it suddenly seemed like the obvious way to extend my stay in Indonesia after my thirty day visa expired. 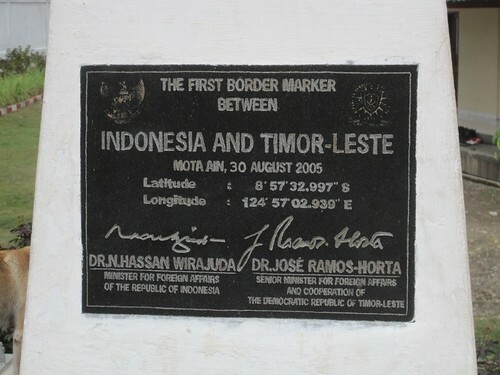 It wasn’t just the chance to get a new visa that attracted me to the country though – East Timor is one of the world’s newest countries, finally gaining independence after 25 years of struggle against Indonesian occupation, and three years of UN-stewardship, in 2002. It hasn’t all been plain sailing ever since (in fact it’s only been moved off the list of countries that the UK advises against all but essential travel very recently) and that, combined with its rather out-of-the-way location means that very few tourists make it to the country each year, which just added to the appeal for me. You don’t have to look very far to see signs of the country’s recent history – on arriving in the capital city, Dili, after a long bus journey from Kupang in Indonesian West Timor, the first thing that strikes you is the huge number of white UN vehicles everywhere. 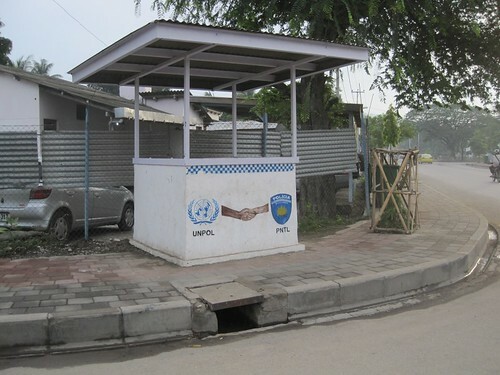 The country may be independent, but the process of building a new country from scratch (as well as repairing all the infrastructure that was destroyed by the departing Indonesian army in 1999) means that the UN and many other international agencies are still present in the country, from army units from Australia & New Zealand, to UN police from all over the world, and countless NGOs working in various fields. All this means that despite the country having only a tiny amount of tourists (apparently less than 1500 a year) there are still foreigners everywhere. The scars of the occupation are still readily visible – despite all the reconstruction that’s been done, there are still quite a few burnt out buildings dotted around the capital. If you want to delve deeper into the country’s recent history, there are several museums and exhibitions devoted to it. Best of all is the Chega! Exhibition, which was set up to highlight the work of the truth and reconciliation commission that was set up after independence, and is a fascinating look at the country’s recent history. One section highlights the role the rather shameful role that other countries played throughout the occupation – from the US’s greenlighting of the original invasion, to Australia being the only major country to formally recognise it (for which they were thanked by getting their maritime boundary shifted to get more than their fair share of the Timorese oil fields, something that the Australian government outrageously has failed to back down on) and my own country for having supplied most of the weapons that were used by Indonesia against the Timorese during the occupation. Re-reading that all makes the place seem a little depressing – but it’s not at all. I had a lot of fun in Dili, despite the best efforts of the weather. I had the misfortune to arrive in the country in the very first week of the rainy season – and it was pretty torrential. That meant my plans to dive were scuppered – the country has some of the cleanest water and best reefs in the region, but the beginning of the rains meant all the silt washed off the mountain and straight into the water, reducing visibility significantly. Any plans to climb Mt Ramelau, highest in the country, were also scuppered. But the rain did clear enough to let me spend a bit of time at the lovely beaches just outside the city. You also get to meet some pretty interesting characters in Dili, a far cry from the usual mix of backpackers I’ve been hanging around with for the first nine months. On my first day on the beach, I met a Jordanian UN policeman and the Portuguese UN Chief of Police, who told me a lot about the difficulties of policing the country. Back at the hostel I met an Australian UN policeman who’d done various stints in the country over the years, and who was able to tell me a lot about all the complications and politics of getting police from dozens of different countries working together in the UN. Via an Australian I met I was invited to a party for the British expats on the island, so one evening I found myself sipping Pimms on a roof terrace with a collection of people working for various NGOs, the hospital, different UN agencies, and even the former British ambassador. Not the kind of party I’ve been used to attending – but it was a great change to experience the rather unusual expat lifestyle. Back in the hostel I also got to meet a Timorese veteran of the resistance movement, who talked a bit about his experience of fighting against and hiding from the Indonesian army during the 25 year occupation. As I mentioned, I didn’t get to travel around the country anywhere near as much as I would have liked, thanks to the weather and the time it took me to sort out my Indonesian visa (and plan my exit from the country – trying to leave in the run-up to Christmas turned out to be surprisingly difficult thanks to all the expats leaving for a Christmas break). But I did make it a few hours along the coast to Baucau, Timor Leste’s second city. 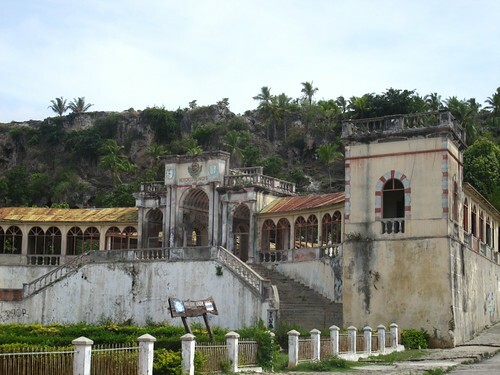 The old town of Baucau has a gorgeous location, sitting on a lush green palm-covered hillside overlooking the sea, and separated from the new town behind by a huge, dramatic cliff. The city has a few better colonial buildings still standing than I noticed in Dili, best of which is the old municipal market right in the centre of town, although that too is semi-ruined. 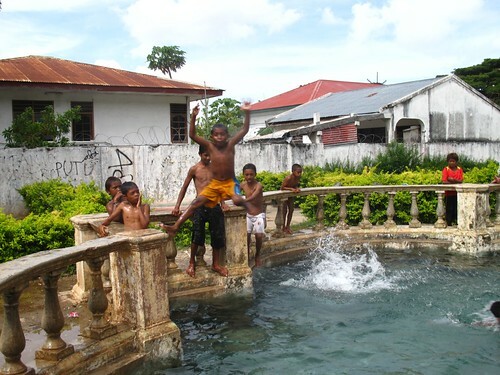 Just below it is a huge fountain that serves as playground and communal baths for all the local kids, who insisted I took lots of photos of them as they jumped in and out of the water. Sadly my plans to spend a couple of days on Baucau’s perfect beaches were scuppered by the rains – which is a shame, as they looked utterly perfect. Likewise my plans to make it further east towards Jaco island, which people speak of in awe-struck tones. 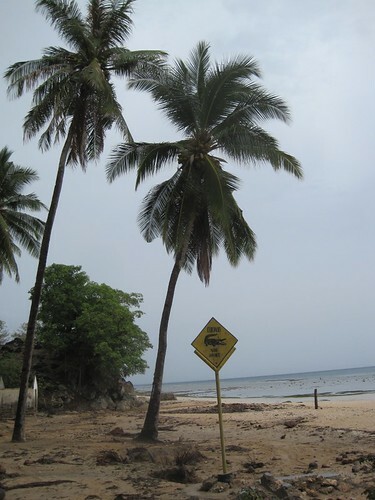 Looks like I’ll have to return in the future – and next time when it’s not in the rainy season. Was it the rain that scared all the tourists off...or the crocodiles?